You can listen to 'Best of friends' here. The saviours of rock and roll? Well, that remains to be seen. And does rock and roll need saving? As long as youths like Palma Violets step up and play this sort of music, apparently it doesn't. If only people my age show up, then the band does not have a future. So here you are. Listening to 180 40 something years of rock come by. Starting in the 60s with The Small Faces, The Who and US garage rock, to punk bands like The Jam, The Clash (excepting reggae) and The Undertones all the way to The Libertines, it all comes by. So do we need Palma Violets if we can tap into this great source of music laying somewhere around the home? As far as I'm concerned, there's always room for a good rock album with loud guitars, brazen singing and a warm organ. So the only question left is, is 180 a good album? At first listen my answer was no, too familiar, not original enough. After the second and more listenings I started to my shift my position. There is a lot of energy on the album and enthusiasm. Not to mention the organ in the background that started to draw my attention. Hey, I'm special, pay attention! The first single, linked to above, was voted best single of 2012 by NME. An honour, but also a kiss-off to obscurity if Palma Violets is unlucky. This weeks candy, usually does not remain so for long. 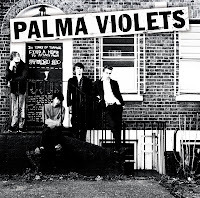 They are signed to indie company Rough Trade, which has a long list of great bands, so that comes in Palma Violets favour. Listening to 'Best of friends' I do not really get it. As far as "song of the year" goes. We (o.k. admitted, my generation) already have a 'Teenage kicks'. The song does have its moments though and is certainly a great opener to 180. 'Best of friends' is best seen as a statement: this is who are and this is what we do. Signed, Palma Violets. The two faces of the band are Sam Fryer (guitar) and Chilli Jesson (bass). They sing and play together not unlike Carl Barat and Pete Doherty did in The Libertines. The organ is played by Pete Mayhew and Will Doyle plays the drums. Together they whip up a storm, although the album is sort of divided into two parts. Up-tempo, garage rock, punky in the larger part, but taking the mood down in the other, with noise eruptions later on in songs. Songs like 'All the garden birds' and 'Three stars' even remind me of 60s crooner Dave Berry. 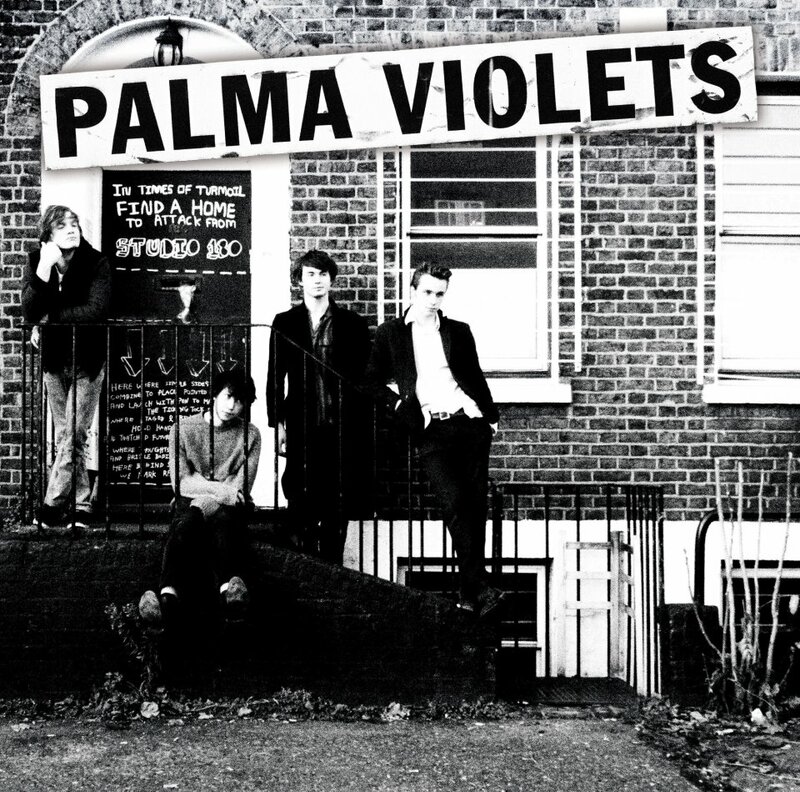 It gave me the idea that Palma Violets has not really decided yet what sort of band to be. '14' is too overly youthful enthusiasm. "I've got a brand new song. It's going to be number 1"? Come on! Lyric wise Palma Violets has some work cut out for them in the future. Musically the band certainly is on the right track. 'Rattlesnake highway' is a great dirty rocker, in which Pete Mayhew's organ comes out pretty good in great 60s sounds. The song also gives away another quality. Sam Fryer's voice has the same punky overtone as Joe Strummer, but also reminds me of Steve Marriot. A little rough edged and hoarse, but certainly full of confidence. 'Tom the drum' lends a familiar progression from the 60s (The Who, The Kinks, The Small Faces), but is enough its own to get away with it and cause some excitement along the way. In short 180 is not the prospected saviour of rock and roll, but Palma Violets definitely holds a promise for the future if they are allowed to develop and do not have to tour for the coming three years, playing the same 11 songs again and again. It will be the end of the band. Come up with a new album in 2014 and 2015 gentlemen and I will see where you stand then.